Whether or not they’re truly Italian, these drinks are a big hit with all ages. If you were to google Italian Cream Soda recipes you would come up with a wealth of ideas based on the concept of mixing purchased flavoured syrups, soda water ice and cream in a glass in a way that lets the syrup sink, the cream float and the drink look five kinds of cool. Because these flavoured syrups work well in flavoured coffees, teas and cocoas, milkshakes, lemonades and cocktails as well as sodas; Italian Sodas and Italian Cream Sodas are often served in trendy coffee shops. Interestingly enough in researching about Italian Sodas, the origins are not, well, purely Italian. Some sites suggest that Italian Sodas originated when two italian immigrants introduced flavoured syrups in 1925, in San Francisco, by adding their syrups to soda water. Other site such as Art of Drink suggest that American companies were already doing this. Wikipedia also suggests that cream sodas were made as early as 1852; and that a patent for cream soda-water was granted in the USA in 1865 to Alexander C. Howell, and in Canada a patent for Ice-Cream Soda was granted in 1886 to James William Black. You can check out more details of these patents here if you are interested. One thing for sure is that mixing soda water and flavoured syrups has been around for over a century. And mixing cream into the drink, either known as the “Italian Cream-soda” or “French Soda” or “Cremosa” is not an Italian concept but still a good idea that has become poplar in North America. So back to the research and into the lab – ok the kitchen but lab sounds cooler. Going back to the original idea of “sodas” – as a drink mixed from home made syrups and club soda – I am taken by the idea. This is something that can be created – using easy to find ingredients available at any grocery store and I can control the sugar and preservatives. And what happens if the syrup is replaced by concentrated juices? Oh the possibilities for recipes. 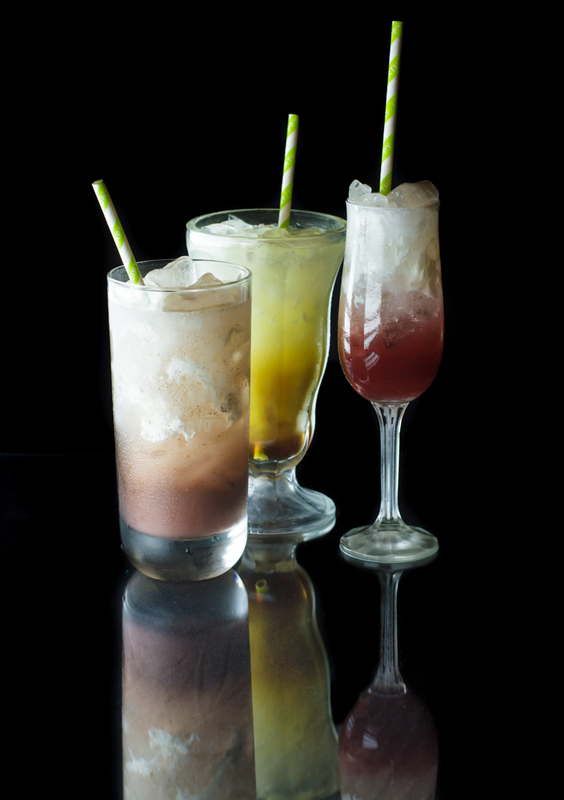 Torani.com has a huge list of Italian Soda recipes based on their syrups. Since I have orange flavoured syrup of my own on hand I check out their Orange Cream Soda recipe. With this recipe, as in most of their recipes, they recommend about 2 tbsp (1 oz) syrup to 1 cup of soda water. If making a cream soda add “a touch of cream”. Going further, other recipes have increased the concentration of syrup, suggesting 3 tbsp (1.5 oz) per half cup soda or 6 tbsp (3 oz) per cup in a website Butter With a Side of Bread, or at Brown Eyed Baker. Other sites like allrecipes.com and Hersheys suggest 3 tbsp (3/4 oz) syrup to 1 cup soda water. Our best bites has a great step by step explanation on how to mix the drink. The secret is to add the syrup, then the ice. Top with soda water and then a splash of cream. The ice keeps the mixture more separated, in theory. Ok time to test drinks. Adding the idea of juices to the concept. I came up with this dazzling creation. Pour cinnamon syrup, then orange juice and simple syrup into bottom of collins or shake glass (it should layer somewhat). Add ice to fill about 3/4 glass. Add 8 oz club soda and a splash of cream. Serve with straw and mix before drinking. When I was a small child orange juice was my comfort food/drink. If my mom was already in the room, I couldn’t call “mommy” and realized that at some level. So I cried “orange juice”. To this day, OJ is one of my favourite drinks. Add a splash of cinnamon, a dash or milk and OH MOMMY! The whipping cream is heavy enough that it floats beautifully on the drink, slowly mixing in to give a nice effect. 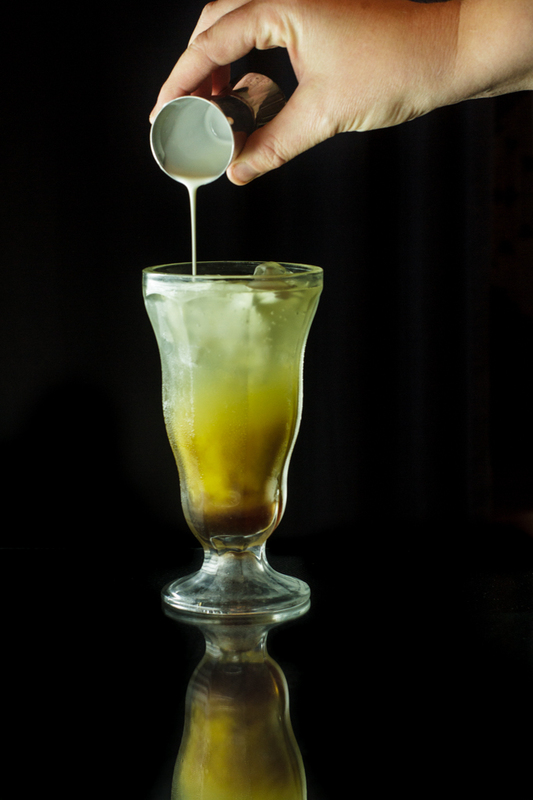 The cinnamon syrup sinks and shows up at the bottom and the ice does the trick of keeping the layers separated when adding the soda water. Seems Our Best Bites was right! What did my family think? It rated one of the better choices (with or without cream) for each of our family members. Simplicity: 4/5 Two recipes to make, one that takes a little time. Ingredient finding: 5/5 It’s all in town baby! Pour chocolate, cherry juice and simple syrup into bottom of collins glass. Add ice to fill about 3/4 glass. Add 8 oz club soda and a splash of cream. Serve with straw and mix before drinking. This is a balancing act between the cherry and chocolate flavour. Depending on the concentration of cherry juice, you may need to tweak this slightly. I made cherry juice out of 1 bag frozen dark sweet cherries and 1 cup water (recipe below) which made a rich dark juice. My youngest daughter didn’t like this when she tried it. She declared she doesn’t like black forest cake. So we told her it was chocolate cherry soda. She tried it again, and loved it. What’s with that?? 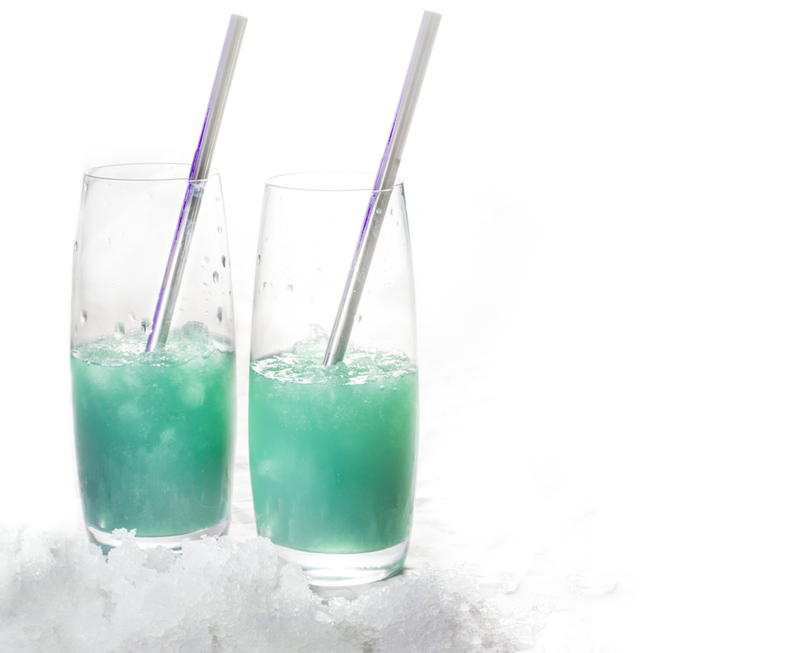 Tried this both with and without the cream, we think the Italian soda (no cream) may have the edge over the Italian Cream Soda or French Soda version. 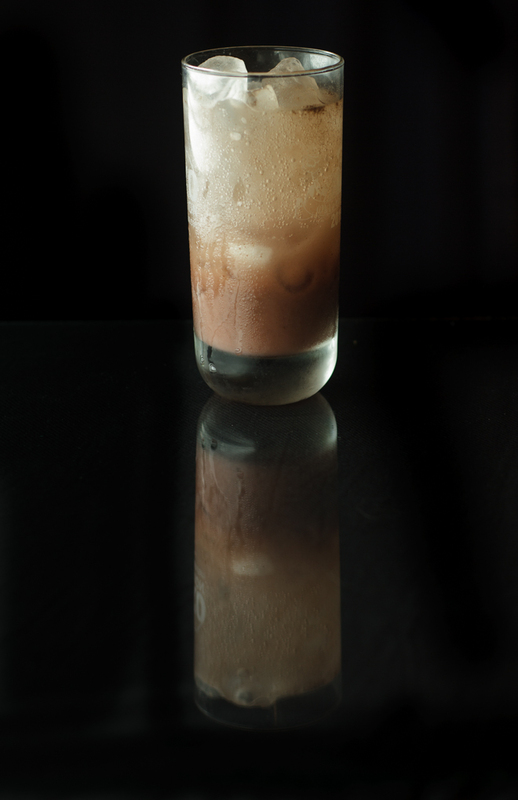 Simplicity: 3/5 While drinking chocolate is easy to whip up, having all the ingredients made and at hand takes time. Ingredient finding: 5/5 all available within town – small town that is! Simmer cherries in 1 cup water for 15 minutes, strain using fine mesh strainer reserving liquid. Return cherries to pot and add remaining water. Simmer another 15 minute, allow to cool. Pour cherries, with the water they were cooked in, into blender and blend until liquified. Strain pulp reserving liquid. Discard pulp. Add 1/2 cup sugar to liquid from both batches and return to heat. Heat just until sugar is dissolved and remove from heat. Cool and store or freeze in 2 oz portions (ice cubes) if you wish the juice to last more than 2 weeks. 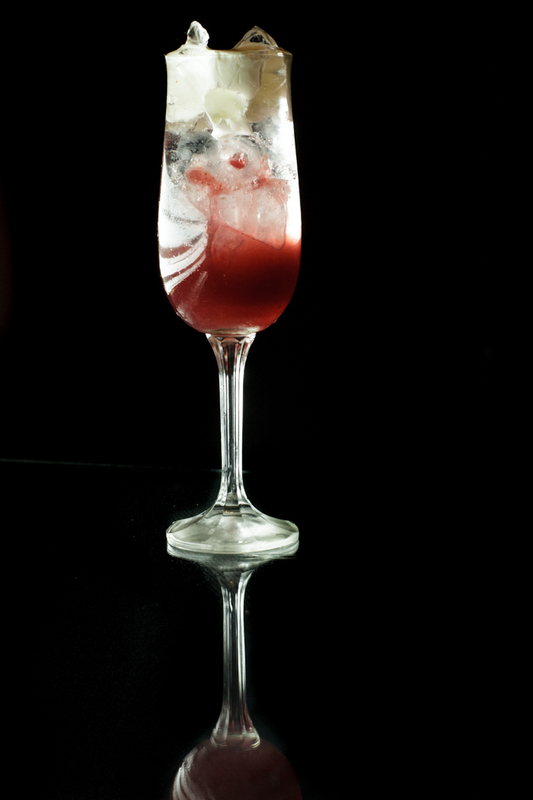 Pour juice and syrups into bottom of glass (collins for full portions or champagne glass for two smaller servings). Add ice to fill about 3/4 glass. Add 8 oz club soda and a splash of cream. Serve with straw and mix before drinking. I served this in half portions in champagne flutes for added elegance and looks beautiful when cream is added. When I first made this I used half and half cream which is normally recommended for Italian cream soda recipes online. The cream quickly mixed into the drink. Using whipping cream slows this process creating beautiful lines of white descending into the red of the juice – just the way it should look. Kid-o-metre 4/5 Both kids liked this but it was not the preferred choice of the three. Taste: 4/5 Lovely, but when I wasn’t looking my husband added chocolate! Simplicity: 4/5 Two special ingredients to make up, again once prep is done it’s a cinch. In chatting with my hubby, who has never been a carbonated drink fan, he regularly ordered Italian Cream Soda’s when out with his buddies back in Vancouver, BC. His reason? The cream mellows out the carbonation making the drink enjoyable. With both my kids and my hubby fans of this concept, I can see that we continue to experiment with flavours in the future, and as long as no more are called after a hated desert, I am betting of further sighs of happiness from my family.